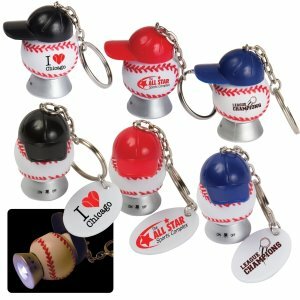 Take your business out to the ball game with the Light Up Baseball and Baseball Hat Key Tag! 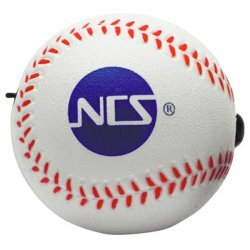 This fun 1" x 1 3/4" x 1" product consists of a baseball with a hat on top connected to a key ring. 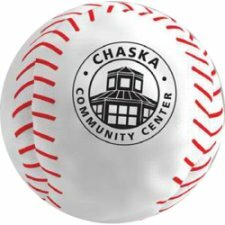 The baseball lights up and leaves plenty of space to add your company's logo through the print option. This useful attention-grabber will appeal to college and pro teams as well as Little Leagues. Hand out this fun promo and your campaign will be a winner! Custom imprint area on the bill of the hat is 1/2" X 5/16" or you can also do your custom imprint on the baseball in an area of 1/2" X 3/8". Less than $ 1.60 each in the minimum of 150. 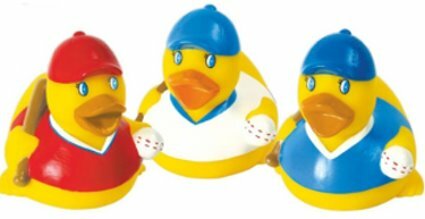 Floatable 3 1/2" X 3 3/8" X 3 3/4" Baseball rubber duck toy. Balanced and weighted. Phthalate free. Custom imprint in an area of 1 3/8" X 3/8". In the minimum quantity of 50 they are less than $ 2.70 each. Baseball - Luggage tag. Printed exclusive with our Digitek 4 color process method directly on plastic with a high gloss laminated finish. Luggage tags are an industry standard but there is nothing standard about our 4 color process, die-cut tags. Easily write your information on the back and choose from any colors for the loop attachment. Travel safe with our luggage tags! Size: 12 - 14 sq. inches. Made in the USA. Your custom imprint area is 2 to 4 square inches. Less than $1.70 in the minimum of 150. Here is the perfect promotional pen for your next event! This exclusive pen features a sporty stress ball, a ribbed rubber grip, and a twist mechanism. 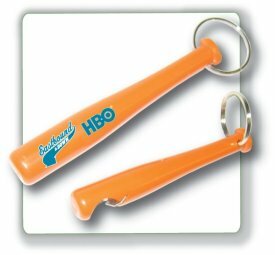 This is the perfect promotional item for high traffic events such as conventions and tradeshows. Customize this pen to make a handy souvenir that will see continuous use from its recipients. The custom imprint area is 1" X 1/2" and in the minimum of 250 they are less than $ 2.60 each. On the left is the 12" Optic Yellow Synthetic, solid cork center that features a 1 3/4" custom imprint area. In the minimum of 50 they are less than $ 5.50 each. 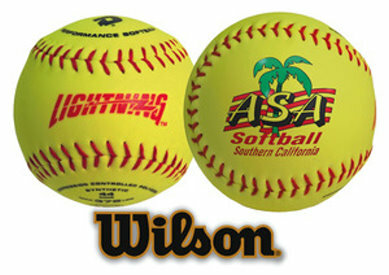 The middle pictured 12" Softball and also the one on the right are Official Wilson Softballs also in Optic Yellow. In the minimum of 50 they are less than $ 8.75 each. Select from 17 different imprint colors. New Xclusive 15 oz. Baseball Handle Mug. Colorful sports handle adds an athletic touch. Dishwasher and microwave safe. 4.5" H x 3.4" Diameter. Your full color custom imprint appears in an area of 8 3/4" wide X 4 1/4" high. Less than $ 6.00 in the minimum of 72. 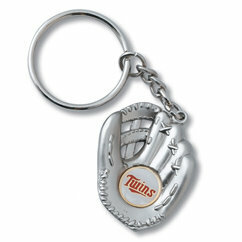 The 3 1/2" X 1/2" Baseball bottle openers with key ring attachment made of durable plastic with metal insert. America's past time is a big hitter. Step up to the plate with the baseball bat opener. The opener is on the end of the bat with the keyring at the handle. The baseball bat opener gives you plenty of leverage at you next promotion. The custom imprint area is 1" X 1/ 2". Less than $ 1.75 each in the minimum of 250. 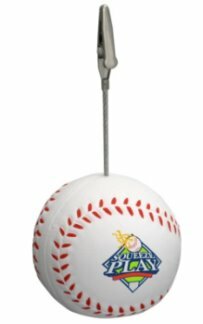 The 2 1/4" baseball memo holder stress ball is a great gift for any baseball fan. They'll use it for stress relief and to hold memos, pictures, baseball cards and more. 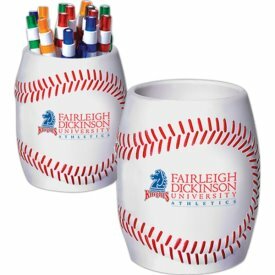 Personalize yours for a fun way to promote your brand during fan conventions, trade shows, and sporting events alike! Safety tested and intended for adults or for general use by consumers of all ages. Custom imprint area is 1 1/4" diameter. Less than $ 2.50 each in the minimum of 150. 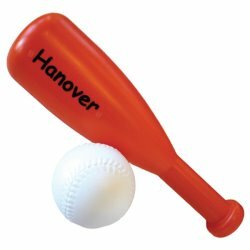 The Inflatable Baseball Bats measure 28" X 5 1/2" and they provide a custom imprint area of 9 1/2" X 2 1/2". Great custom imprint product for company and church picnics. Less than $ 2.45 each in the super low minimum of 50. Available in Yellow or in woodgrain Brown/Yellow as per picture. Rubber at bat baseball 3 1/2" X 3 3/4" X 3" frog toy, floatable, balanced and weighted. It has a hat, shirt and a baseball in one hand and a bat in the other hand. Great for baseball promotions of all kinds. The custom imprint area is 1" X 1/2". In the minimum of 50 they are less than $ 2.85 each. Hit one out of the park for your business when you market the Baseball Poncho! This 5 1/2" rain poncho comes packed in different ball shaped cases each with easy spring clip which makes transportation simple. Thanks to the printed process you can add on a custom message, your company name or logo to gain some exposure. A great promotional product for teams, stadiums and other sports themes! Your custom imprint area is 7/8" X 3/4". Less than $ 3.70 each in the minimum of 50. 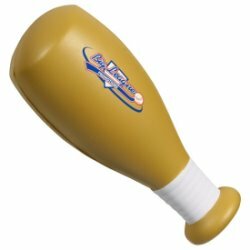 This 4 5/8" X 1 3/8" X 1 1/2" Baseball bat shape stress reliever helps relieve stress and have fun! After squeezing their stress away, your customers' will be in full swing to carry out their day! All thanks to this helpful stress reliever with your logo! Your custom imprint area is 1 1/4" X 7/8". Safety tested and intended for adults or for general use by consumers of all ages. Not intended for children under three years old or for pets. Less than $ 2.40 each in the minimum of 150. Show people your passion for your favorite sport with the 1 1/2" X 1 1/2" Homerun Keychain. This is not your standard keychain as it can also serve as a stress reliever. The squeezable foam material allows you to take out some stress in a healthy way. 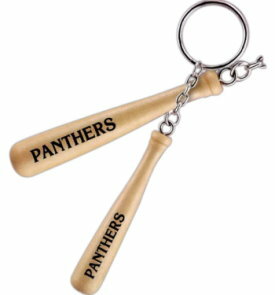 These keychains will vary in density, color, size and weight due to the molding process. The custom imprint area is 1/2" X 1/2". Less than $ 1.35 each in the minimum of 500. What a great product to include a company logo! 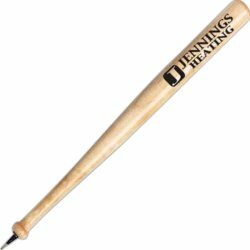 The original 8" wooden baseball bat pen is not just for sports themed events. Promote new products, services and programs and get Grand Slam results. Create a collectible series of promotions that will keep your name or brand to the forefront long after your promotion is over. Your custom imprint area is 2 1/2" X 1 1/2". Less than $ 1.70 each in the minimum of 150. The Baseball Grill measures 15" X 15" X 16" is White with Red imprinted Stitches & wooden handles and locking lid. The cooking area is 14 1/2". The custom imprint area is 2" X 6" or 3 3/4" X 3 3/4". The minimum imprintable quantity is 120 and they are less than $ 50.00 each. 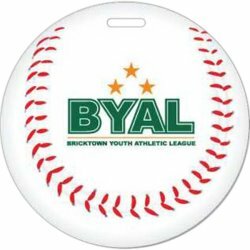 The Baseball shape CD Holder measures 5 3/4" X 5 3/4" with a custom imprintable area of 2" high X 1 1/2" wide and it holds 24 CDs. Less than $ 4.60 each in the minimum of 100. Made of faux leather and measuring 3", they're perfect gifts for both kids and adults. Add your custom imprint and hand out at the next company picnic. Ideal for tradeshows, conventions or fundraising events. Your custom imprint area is 1 1/4" in diameter. 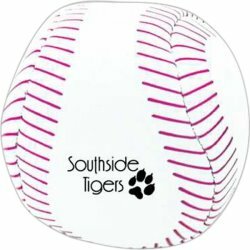 Available with imprinting or without, depending on your project needs.Minimum imprintable quantity is 150 baseballs and they are less than $ 3.00 each. The 18" Wood Baseball Bat can be laser engraved. The custom imprint area is 1" high X 4 1/4 wide". In the minimum of 50 with a one color imprint the price is $ 4.25 each. 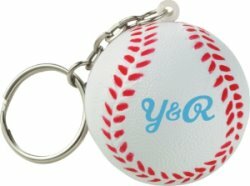 The 2 1/2"Baseball stress ball yo-yos are a standard stress ball with a twist: it has an elastic string attached to an adjustable Velcro finger strap that allows you use it like a yo-yo! It will make it easier to pitch your ideas at any meeting, trade show, or convention! Safety tested and intended for adults or for general use by consumers of all ages. Not intended for children under three years old or for pets. The custom imprint area is 1 1/4". Less than $ 1.85 each in the minimum of 150. Hit a home run at your next marketing event with t his 5 1/4" x 1/2" natural wood bat key tag that is sure to turn the heads of a few sports fans. You can complete the promotional product by adding your company's logo in the imprintable area of 1/2" X 3/16"Easy to carry. This useful attention-grabber will appeal to college and pro teams as well as Little Leagues. Hand out this fun promo and your campaign will be a winner! Less than $ .80 each in the minimum of 250. 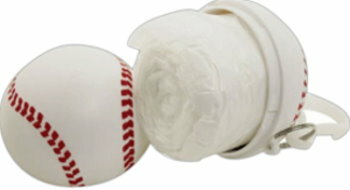 Hit a homerun with this plastic 3" X 3 1/2" X 3" baseball shaped coin bank on base! 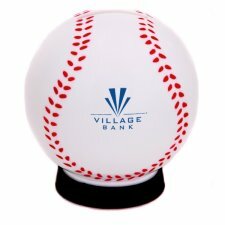 This baseball bank features a top money slot and a bottom removable cap for easy release. This is the perfect gift for promoting personal savings, credit, insurance, lending, company cost cutting programs and more! California law now states that warning labels must be included on all consumer products shipped to the state of California. A great way to promote any event! Custom imprint area is 1 1/4". Less than $ 2.00 each in the minimum of 150. 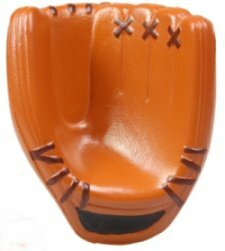 Catch your client's attention with this 3" X 2 1/2" X 1 3/4" baseball glove stress reliever! This mitt features stitching and wear marks just like the real thing. With several imprinting options available, you can customize this glove for any sporting event, convention or marking campaign. This glove can also be ordered as blank stock. This is the perfect promotional item for athletes, coaches and parents alike! A great way to promote any event! Copyright. Your custom imprint will appear in an area of 1" X 1 1/2" on the back of the glove. Less than $ 2 each in the minimum of 150. 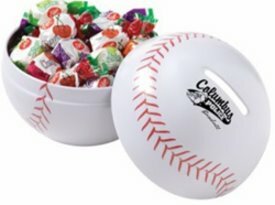 Baseball - Get your next marketing campaign off and running with our best-selling 2" bean filled vinyl kickballs! Great for any promotional event, these inventive sport toys bring a smile to people of all ages. A great giveaway idea for tradeshows, conferences and fundraisers. Ideal for colleges and athletic leagues. Toss em'! Kick em'! Whatever you do, you'll have fun! Your custom imprint area is 1" X 3/4". Less than $ 1.10 each in the minimum of 150. 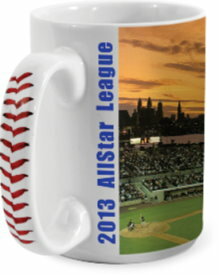 This strong Baseball polyurethane can holder with textured grip, holds a 12 oz. can, 4 1/2" tall, 3" bottom diameter. The custom imprint area is 1 3/4" in diameter. Less than $ 5 each in the minimum of 75. Here is a 1/5/16" X 1 1/2" mini-baseball glove on a key chain with a 3 link chain and this item is sure to be a hands on key tag that every fan will want with their company name on. 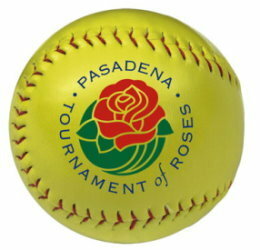 The full color photo dome provides a custom imprint area of 1/2" in diameter. The minimum on this product is only 100 and is less than $ 3.90 each. Hit a home run with this baseball cow bell! This round metal cow bell features baseball art and can be ordered as blank stock or can be customized to your specifications. This item is a great way to show support for your local, school or professional team. This bell features a top handle grip for added convenience. 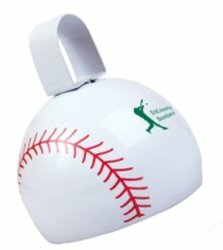 Ring in success at your next event or special occasion with this baseball cow bell! A great way to promote any event! The customer imprint area is 1 1/4" X 5/8". Less than $ 2.30 each in the minimum of 150. Hit it out of the park with this convenient baseball tote bag! Constructed out of lightweight and durable polyester, it easily folds into the attached nylon spandex pouch and compacts into the size of an orange. Conveniently store it or use it to play catch. This reusable tote bag expands to 16" x 18" and provides plenty of space for books, groceries, or souvenirs. Customize it with our full color process or use it as a blank product. Your custom imprint area is 10" X 11". Less than $ 6.70 each in the minimum of 100. 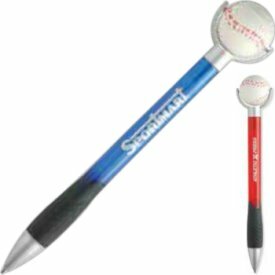 Make your next marketing campaign a "Grand Slam" when you add your company name or logo to this 5" fun-sized ballpoint pen! 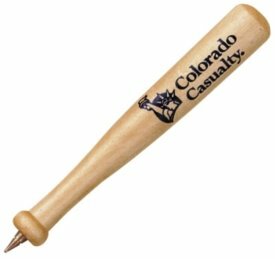 With a miniature sized baseball bat replica made of actual wood this unique writing implement is perfect for sporting events, school fundraisers and championship games. A memorable tote bag insert or tradeshow giveaway this would also be great for stadium gift shops, airport kiosks or tourist attractions. Your custom imprint area is 1 3/4" X 3/4". Less than a dollar each in the minimum of 300. 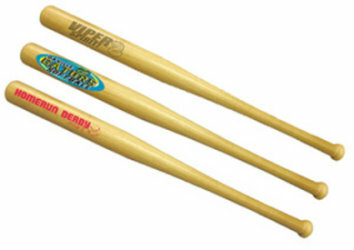 14" X 4" Baseball Bat and Ball set is geared to children of all ages. Great company picnic item! Get your game on. Your custom imprint area on the bat is 3" X 1". Less than $ 6.25 per set in the minimum of only 48 sets. 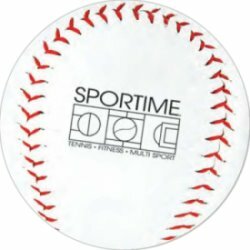 Here is a baseball shape seat cushion that measures 14" X 1 3/4" and has a large imprintable area for the message of your company or organization. Every baseball rooterwill want one of these for the best seat in the house. 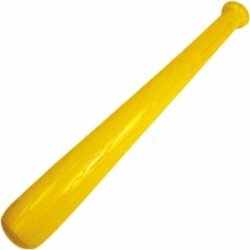 The foam 17" baseball bat is available in Apple Green, Blue, Orange, Red and Yellow The foam baseball is available in Blue, Gold, Gray, Green, Maroon, Orange, Purple, Red and Yellow and also can be custom imprinted. The minimum imprintable quantity on both items is 100. Call 800 960-9080 for current pricing. Here is a 36" inflatable baseball on the left and a 14" inflatable baseball on the right that we can custom imprint to your specifications. The 36" size provides an imprint area of 10 1/2" X 6" and the 14" size has a custom imprint area of 5" X 2 3/4". Also available in a 4" size with a custom imprint area of 2 1/2" X 1". In the minimum quantity of 50 the 36" size is less than $ 5.90 each, the 14" size is less than $ 2.50 each and the 4" size is less than $ 2.25 each. 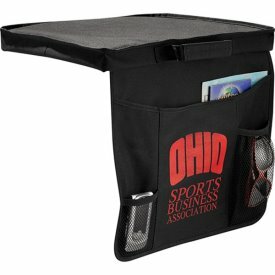 Be comfortable at your next sporting event; take the Game Day 2" X 16" X 12" seat cushion with you. This cushion has a 1'' thick interior. It's lightweight and has a handle to make transporting it from event to event a lot easier. There's a flip down organizational panel with little compartments for storing water, programs, or blanket. Debossing and silkscreen is available for imprinting logos. Less than $ 10.50 each in the minimum of 72. Enjoy your favorite teams in comfort, order your cushions today. The foam baseball glove is a great give-away for kids. It is available in Apple Green, Blue, Orange, Red and Yellow and measures 7 1/4" X 7 1/4" X 3/8". Minimum imprintable quantity is 100 and they are less than $ 2.35 each in the minimum of 100. Squeeze away the stress of everyday life with our handcrafted stress reliever! 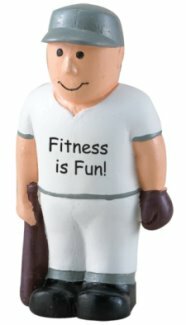 This item is made of polyurethane foam and shaped like a baseball player. Measuring 2 3/4" x 4" x 1", you can customize your promotional product as the project needs demand. Due to their handcrafted nature, colors and textures may vary. Not intended as a child's or pet's toy, but ideal for office employees, teachers and call centers. Copyright. CLOSEOUT PRICING. Your custom imprint area is 1" X 1". Less than $ 1.55 each in the minimum of 150. Promoting has never been this tasty! Our small themed tin with hard candy is the ultimate gift that no sweet tooth can resist. Comes with your choice of any 3 hard candies. Tins measure 4" diameter. Great for the holidays or for everyday gift-giving. Hand out as party favors or tradeshow give-aways. Imprinting options available for that lasting impression. Custom imprint area is 2" X 1 1/4". Less than $ 10.50 each in the minimum of 50. Festive fundraiser. 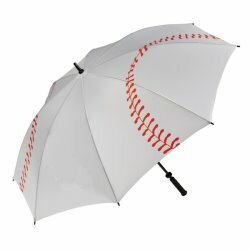 Umbrella with baseball design, 62" arc. Choose our sport umbrellas for an excellent fundraising vehicle or to keep the sidelines uniform and spirited. Our rain umbrella products visibly show support and are functional in high winds. Feature: Solid fiberglass ribs. Black braided fiberglass shaft. Slip-resistant pro-grip rubber handle. Customizable handle medallion. Less than $ 28 each in the minimum of 25.